Just like any other post type in WordPress, you can manage your scratch card sets in your wp-admin area under the “Scratch Cards” menu. Here, you can see each set that exists on your website, the logo it uses, the sets ID, status, setup and once a set has been generated, the remaining cards. 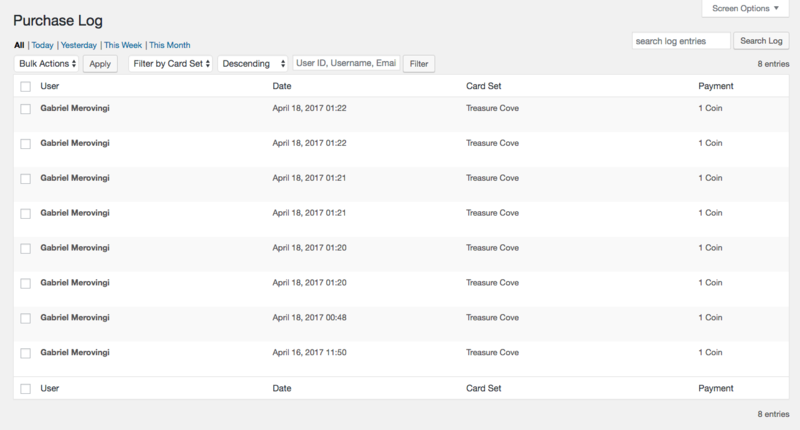 Both the setup and the remaining section are broken down by payout type, showing how many card of each type was generated or still exists. draft No The Card Set has been saved but no cards have yet been generated. The set is not visible to users. activated Yes The Card Set has been saved and cards have been generated. The set is available to users. onhold No Optional temporary block of further card sales. Cards are still in the database but no purchases or plays are allowed. soldout No All cards in the set has been purchased and played. As of version 1.2, you can clone an existing set in your admin area. Simply move your mouse over the sets title and in the links that appear below, select “Clone Set”. The new cloned set will be saved as a draft, which means that you will need to edit it and click “Activate” in order to generate the cards and activate the set. You can clone sets of all types except for trashed ones! As of version 1.2, the plugin adds in a dedicated page in your wp-admin area where you can view / search or export log entries for scratch card purchases. Note that cards you give to users will not be included in this list. As of version 1.2, the plugin adds in a dedicated page in your wp-admin area where you can view / search or export log entries for scratch card winning payouts.